Internal audit is a process which helps organisations to achieve their objectives. However, Internal audit is related to the evaluation and the improvisation of the effectiveness and efficiency of the risk management, control and governance processes in an organisation. Also, Internal auditing acts as a catalyst to improve an organization’s governance, risk management and management controls by providing insights and recommendations based on the analyses and assessments of the available data and the business processes. An internal audit assists an organization in defining areas where it could improve, while also providing information it needs to accomplish its goals. With commitment to integrity and accountability, internal auditing provides value to governing bodies and senior management as an objective source of independent advice. Professionals called internal auditors are employed by organizations to perform the internal auditing activity. To do this, internal auditors work with the management to systematically review systems and operations. These reviews (audits) are aimed at identifying how well risks are managed including whether the right processes are in place, and whether agreed procedures are being adhered to. Audits can also identify areas where efficiencies or innovations might be made. Internal audits are organised under an ongoing program of review and advisory activity which is based on the strategic needs of an organisation. Due to their role, internal auditors work across all the areas of an organisation. In addition to the core areas of financial control and IT, they review the tangible aspects of operations, such as an organisation’s supply chain or IT systems; as well as more intangible aspects such as organisational culture and ethics. In fact, any system that has an impact on the effective operation of an organisation may be included in the scope of internal audit. Internal audit reports are presented to the CEO and board (via the audit committee). As they provide an independent viewpoint on the extent to which an organisation is poised for success. And advice on areas for improvement. Internal auditors work in all sectors (public, private and not-for-profit). And may work as an employee of the organisation, or through an external service provider. What is the Difference Between Internal and External Audit? Internal auditors are often confused with external auditors. However, there are significant differences between the professions. External auditors focus on the accuracy of the annual report and financial statements. Whereas the internal auditor has a wide reaching brief which considers anything which might be important to an organisation’s success. The objective of an external audit is to give reliability and credibility to the financial reports that go to shareholders. The objective of an internal audit is to educate management and employees about how they can improve business operations and efficiency. External auditors have no responsibility to the organization other than determining the accuracy of annual financial statements. An internal auditor is a trusted consultant charged with advising upper management on how to best manage the company’s risks and goals. An external auditor reports to shareholders who are outside the governing structure of an organization. Whereas an internal auditor reports to those within it. 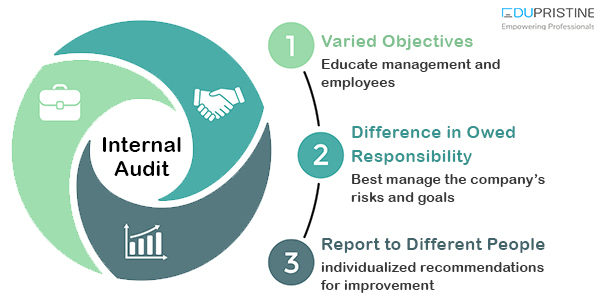 Relevant employees will receive a copy of the internal audit with individualized recommendations for improvement. Thus, internal auditors play a very important role in the smooth working of any organisation. To know more about internal audit, you can join the Chartered Public Accountant (CPA) course. It is offered by institutes like EduPristine to clear the international CPA exam. In case you are interested in the CPA course, please click here to know more about the same. How to understand and interpret cash flow statement?